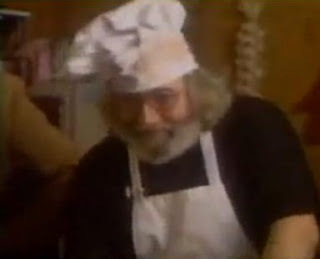 If only the Food Network existed in the 80's, we would have had a winner. In this most bizarrely comedic clip, Chef Jerry Garcia demonstrates his culinary skills backstage at a Dead show on 12/31/85. Jerry not only discusses his favorite hors d'oeuvres, but actually instructs on how to prepare them! His daily specials include: "lean" bacon-wrapped water chestnuts and bundt cake wedges. I repeat: bundt cake wedges. The Dead were known for their comedic interviews -- especially those done by Al Franken during the historic 1980 Radio City shows -- but this one takes the cake (pun intended). And no, you're not imagining things -- amongst those in the clip's intro are Mickey Hart, Ken Kesey, Larry Bird and Kevin McHale. Ummm...no comment. "Doesn't EVERYONE keep﻿ their powdered sugar in a big zip lock bag?" very interesting selection of clips.